Good stuff. Well done Eamonn and Simon. Dumb all over, a little ugly on the side. Would be great to hear some shows about Preacher, Nikolai Dante, the Dredd mega epic and Button Man in future shows (to name but a few). 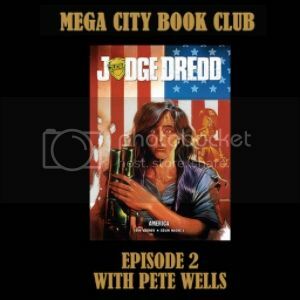 Lured by the promise of a pasty and a cuddle Pete Wells joins me in Mega City Book Club to discuss one of the all time classic Dredd tales. In your podcatchers now and also on the slightly rejigged blog site. Brilliant podcast Eamonn. Made me want to read America again. Both episodes have been really enjoyable. Keep up the good work. Thanks, SpongeJosh. We appreciate it. 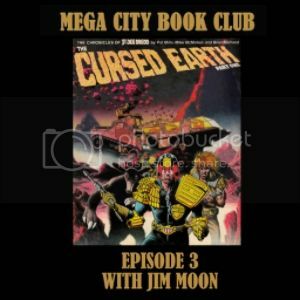 I'm joined by Jim Moon from the Hypnobobs podcast to discuss The Cursed Earth and to look forward to the new edition. Please follow, like and share on Facebook, Twitter and Justgiving.com. These podcasts are my favorite on the web. Another brilliant episode! Love the enthusiasm everyone has for their chosen books. Wow, Spongejosh, thanks. It's an enthusiastic podcast. Pick a book and come join us? I would be honoured. Thank you for the offer. This is great - I've thoroughly enjoyed listening to people share their favourite books. Out of those so far it's a tough choice, but Pete Wells was very convincing re America, and how it depicts the Judges. 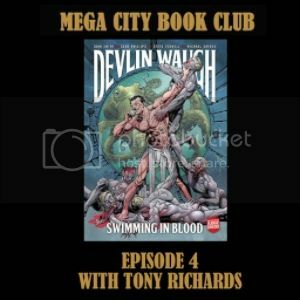 Episode 4, in which I'm joined by Tony Richards in the Crown and Anchor for a brief discussion of Devlin Waugh: Swimming in Blood. There is some background noise as it's difficult to find a quiet spot in a London pub. I'm going to move up the release dates so the next episode on Mandroid with Steve Green will be out in 2 weeks.